If you follow my food Instagram, you may’ve seen this sweet potato breakfast bowl pop up before. I’d seen people add almond butter to sweet potatoes before, and I got the idea of having a sweet potato bowl for breakfast from Jen. Then, I decided to put my own spin on a sweet potato breakfast bowl. Just almond butter on top is great, but adding raisins and nuts makes it even better. 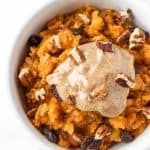 This almond butter, raisin, and nut topping reminds me of sweet potato casserole, which I loved for the first time ever this Thanksgiving and crave all of the time now. Wash sweet potatoes and poke a few times with a fork for steam to release while in the oven. Then, I’ll lightly dry them and wrap them in foil, placing them in the oven seam-side up so any juices released during cooking don’t land on the bottom of the oven. I usually bake sweet potatoes at 375 degrees. For medium/large sweet potatoes, I bake them for about an hour and 20 minutes. For smaller sweet potatoes, I bake them for about 65 minutes. They’re done when I can easily pierce them with a fork. I let the potatoes cool for at least five minutes before peeling and mashing them. I mash the sweet potatoes with lots of cinnamon to taste, plus either a drizzle of honey or half of a ripe banana for some sweetness. I add a sprinkle of pecans and raisins and then drizzle with almond butter if I’m going to eat it right away. If not, I store the mashed sweet potatoes in a glass Tupperware and add the almond butter before reheating. I typically bake two sweet potatoes at a time since the leftovers are good for a couple of days. I pop ’em in the oven whenever I know I’ll be around the dorm for at least an hour and a half, whether it’s after dinner or in the morning before I leave for class (I’ve also been known to put them in the oven before I leave for a run and take them out when I get back). Trader Joe’s creamy raw almond butter is my all-time favorite.This stuff is dreamy. Trader Joe’s is also my go-to place for organic raisins and nuts since its prices are super reasonable. 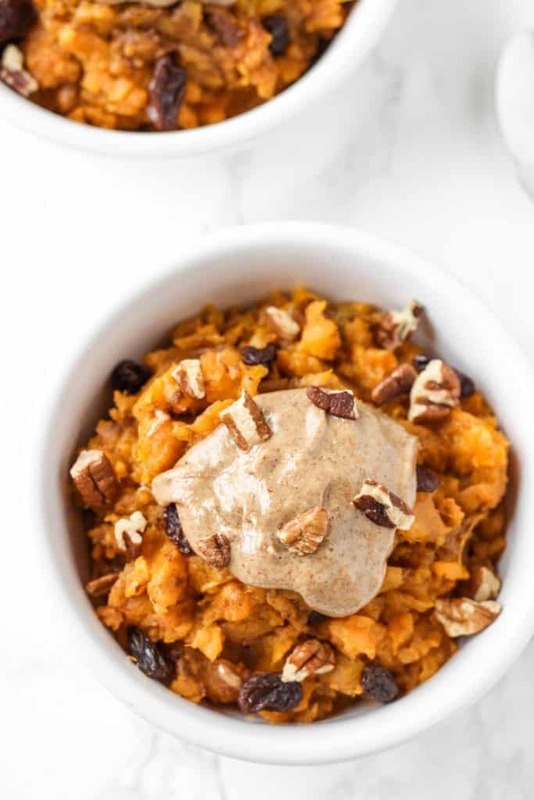 I enjoy this sweet potato breakfast bowl once or twice a week for breakfast but probably more often, I eat it for an easy dinner (along with a smoothie or some other type of protein) on days I get back to my dorm room late after a full day of classes and meetings and study sessions. My breakfasts and dinners have become kind of interchangeable lately, anyway. Peanut butter oatmeal for dinner? Leftover roasted veggies & chicken sausage for breakfast? 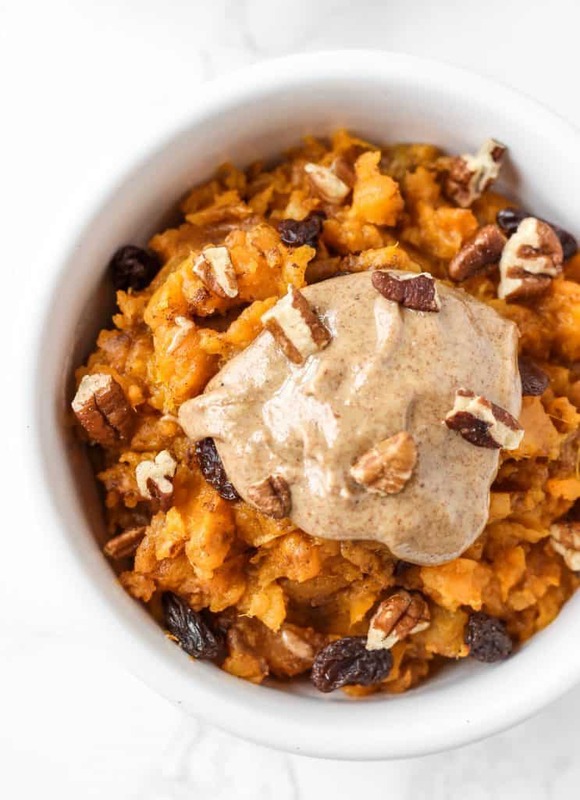 This sweet potato breakfast bowl for breakfast AND dinner AND snacks? Yes, please. *Omit honey for Whole30 compliance. *Dried fruit and raisins are Whole30 compliant, although the program recommends not overdoing it on fruit. It honestly sounds like the strangest combo to me but it somehow works so well! Yes! Sweet potatoes are something I pick up pretty much every single time I go to the store! I will definitely have to try this! I would probably add some greek yogurt and have it for breakfast. This is so adaptable so you can totally make it your own! The way we like too cook sweet potatoes is in a pressure cooker. Once up to pressure, it only takes about 18 minutes to cook. A fast meal for us is to cook the sweet potatoes in the pressure cooker. After those are cooked and cooling in the pressure cooker, we put a can of black beans in a pot and add salt, pepper, cumin, coriander, garlic powder and onion powder (about quarter to a half a teaspoon each or to taste) and heat all of the ingredients through. Once those are nice and bubbly, serve over peeled (or not) sweet potatoes and top this with sour cream or Greek yogurt and fresh cilantro. Fast, easy and filling. I will have to trot down to the local Kroger’s soon to get the sweet potatoes and almond butter to make this. It sounds delicious. 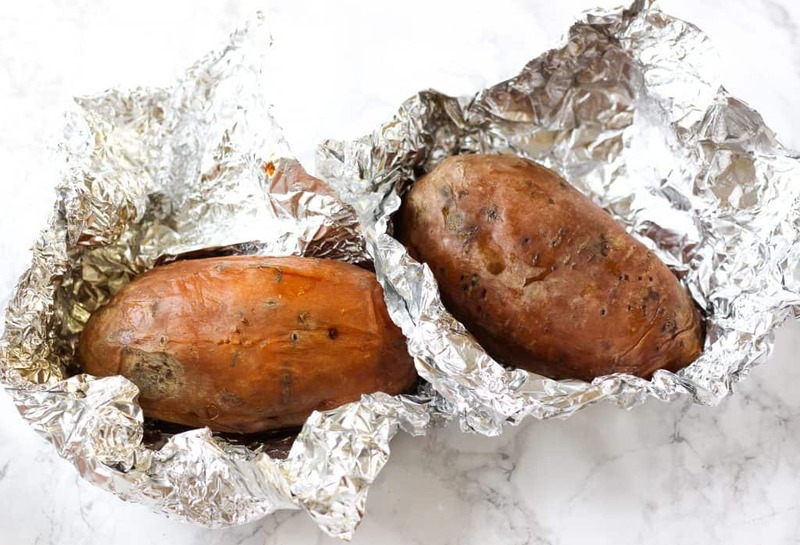 I’ve never tried cooking sweet potatoes in a pressure cooker, but that sounds awesome and so quick. I bet your sweet potato and black bean meal is absolutely delicious! Sweet potatoes + black beans are such a great combo. Yes it’s fast and that’s why we like it. It really amazing what you can cook in one. We use a Hawkins Futura model. Supposedly, the best ones are made in India. I have no idea if that’s true or not, but we have had this one now for over 20 years of steady use and it is made in India. Check into a pressure cooker. I don’t think you will regret it. That and crockpot do make life a lot easier. Do u poke holes in them or any other prep before putting in pressure cooker?? No. Our pressure cooker has a trivet and we just place the sweet potatoes on the trivet and add water to cover the trivet. Bring the water to a boil, close up the pressure cooker and bring up to pressure. On ours, the pressure cooker makes a sound choo-choo sound like a steam engine when it is at proper pressure. It’s Hawkins Futura model. When it’s up to pressure and making the choo-choo sound, reduce hear to medium-low or low and let it cook for about 10 to 12 minutes. Take it off the heat and let cool a bit. That’s it. Comes out like a moist roasted sweet potato. The way we like to cook sweet potatoes is in a pressure cooker. Once up to pressure, it only takes about 18 minutes to cook. This sounds absolutely delicious! I need to try this recipe out… thank you for sharing! Never had a sweet potato for breakfast. Maybe I should try it. This looks fantastic and is a perfect way to change up the oatmeal routine (which I have every day!). I bet a poached egg on top would also be great and add a bit of protein. Thanks for sharing! Mm that does sound delicious! Thanks, Edye! Hope you have a great week, too! And I so hear you on interchangeable dinners and breakfasts. I just eat whatever I’m in the mood for and have time for, and sometimes that’s sweeter dinners and more savory breakfasts. I’ve always been a sweet breakfast kind of girl, but lately, savory breakfasts have been sounding better and better! Love my oatmeal, too, and since it takes no prep, it’ll probably always be my go-to. But I’m LOVING this sweet potato bowl right now for a switch-up! It’s so versatile with toppings and just as good without the raisins if you’re not a fan. You’ll have to let me know what you think! Can you use coconut oil instead of almond butter? Thank you!!! In a rut with my Whole30 and this was just what I needed! I omitted the raisins (not my thing) and added some shredded unsweetened coconut to it and it was absolutely delicious! So glad to hear you enjoyed this, Shaundra! I’ve started adding unsweetened coconut lately, too, and it’s so yummy! This looks delicious. Can’t wait to try it. But correct me if I’m wrong, but honey is not Whole30 compliant, correct? Try wrapping them the same way and putting a bunch in the crockpot on low overnight! You’re set for the week and they always come out perfect! Yum! Thanks for the tip, Jenn!! I am going to cook my sweet potatoes today! Any idea of the calories for your recipe ? Hi Dana! I didn’t include nutrition info for this recipe since the stats will vary depending on the size of your sweet potatoes. I’d recommend weighing your sweet potatoes and then adding up the stats by hand to include the raisins, almond butter, etc. It should be relatively simple since there are just a few ingredients in this recipe 🙂 You can also use a recipe nutrition calculator like this one. Hope that helps! I found this recioe on Pinterest yesterday, tried it today, and loved it! It will definitely be placed in my regular breakfast rotation. Thank you for sharing it. I’m so glad to hear you loved it, Stephanie! This continues to be one of my favorite hearty + healthy breakfasts! Just found your recipe and can’t wait to try it. Sick of eggs sometimes! 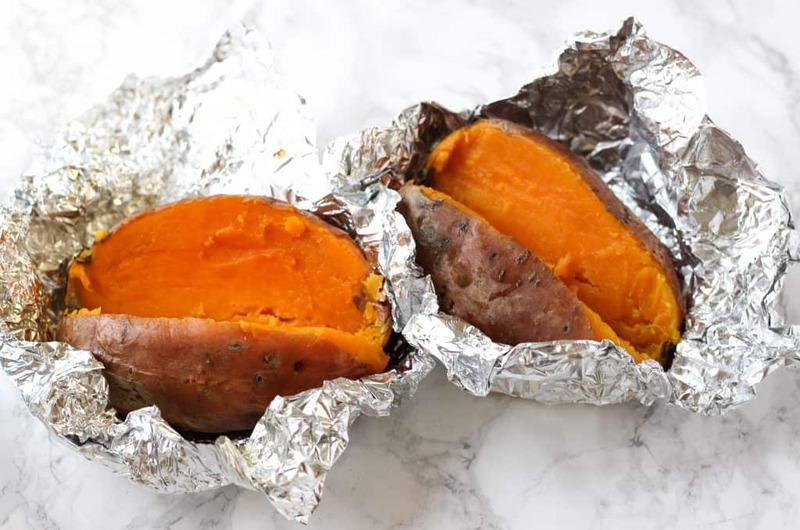 You should get the potato express – about 6 minutes for sweet potatoes in the microwave. I love that these can be made ahead, and can be portioned in perfect snack-sized portions! I’m going grocery shopping today and will grab some sweet potatoes. I’ll cook them all up, portion them with some nut butter and reheat at work the next few days for a snack. Such a great idea. Maybe I’ll add some protein powder also! Sounds like a great plan! Hope you love ’em!! For some reason, almond butter tends to change texture a bit if added in advance so I like adding it right before I eat it since it doesn’t take long to add it! Either way should work, though. Hey Meg!! I hope you loved this! I bet it’s a great way to start the work day at your desk. I brought it (for lunch actually) to work this summer, too! I’m so glad you enjoyed this, Joanne!! Just found this recipe. Looks great! I’m wondering if this recipe would work as well with canned organic pumpkin? Having another option on the fly, when you have an ill prepared morning and need a really quick “open a can” situation, when there is no time for baking sweet potatoe(s). May not be as sweet, but seems to me would be equal or close to equal nutrition. Just learning about Paleo and looking for good breakfast options. Thanks. I’m trying to do breakfast things that I can make ahead on Sunday and will last me for the week (Mon.-Fri) has anyone tried this with this particular recipe? Hi Laura! I’ve done that before and it works well! I’d suggest waiting to add the almond butter until the day you plan to eat it, but you can prep the rest in advance! I fixed this for my mid-morning snack, and it was delicious and filling. Thank you! I plan to try it again for breakfast. Yay, I’m so glad you enjoyed this sweet potato bowl, Kimberley! I love it, too!! 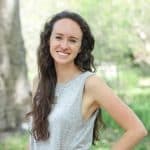 I recently started a nutrition challenge with some folks at my gym. I haven’t been eating enough carbs because I am still learning how to incorporate the good kinds as opposed to bread and pasta. I hate sweet potatoes for dinner (like pairing it with chicken) so I figured I would give this a try for breakfast/snack. It was really good! I paired it with eggs this morning. Thanks for the recipie! I’m so glad you enjoyed this recipe, Alesha! I agree– I’ll take sweet potatoes for breakfast over dinner any day! Last month I started a nutrition challenge with some friends from my gym. I cut out the bad carbs but quickly realized I wasn’t getting enough carbs period after that. I have never been a fan of sweet potatoes for dinner so I thought if I can find something sweet for breakfast or a snack, that might work. I LOVE this recipe. The challenge is over but this is still my new favorite go-to snack/breakfast. I have had quite a few people ask for the recipe as well. The only difference is instead of raisins and nuts I prefer raspberries since raw almond butter is so dry. The juice from the berries helps with that. Oops I didn’t think my original comment ever posted lol. Went to search for the recipe to send to a friend and thought I would try commenting again haha. This sounds delicious. Have you ever used pure maple syrup instead of Honey for sweetness? Just found your recipe and can’t wait to try it! I made sure I commented on the Sweet Potato prompt, too! WOWZA!!! Thanks for the opportunity! Do you have a suggestion for a swap for the almond butter? I have an allergy to almonds. Have you tried sunflower butter or peanut butter? Just wondering what the best option might be…. Thanks! Hi, Judy! You can also use sunflower butter or peanut butter– I’ve tried both! This is sooooo good! I have it almost every morning. I add dates and bacon and cinnomon almond butter to mine. Really good!! Mmm, cinnamon almond butter sounds delicious! So glad you’ve enjoyed this breakfast!